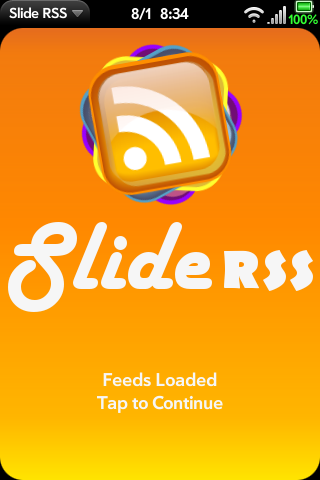 Slide RSS+ (or Sliderss+, if you like) turns your phone into a constantly changing digital photo frame. It provides you with a slideshow of photos, sourced from any number of Media RSS feeds or from the photo albums you already have on your device. Add any Media RSS feed or add the default samples from FrameChannel, Flickr, Photobucket, FoxSaver, EarthShots, Yahoo, National Geographic, NASA, and Weather Underground. Add all your local photo albums - the same ones that are available in the Photos app. Tap and drag to reorder your feeds or swipe to delete any feed. Watch any feed as a standalone slideshow or watch any combination of feeds. Quickly and easily set a playlist of just the pictures you want to see in your slideshow. Randomize your slideshow order with a quick shake. Flick left to jump to the next picture or flick right to jump back to the previous picture. Flick up to immediately hide the current picture from the slideshow and prevent it from being shown again. Pinch/unpinch to zoom with more precision on the current picture. Hide, to remove the current picture from the slideshow's playlist. Pick any JPG or PNG picture to use as your Wallpaper - you can Center it, Zoom it, Stretch it, or Crop it any way you like. Send an email with any picture and include information about the original picture and the original RSS feed. Send an MMS with any JPG picture and include information about the original RSS feed. Automatically load the last running slideshow. Just end the program while in that slideshow. Slideshow Settings let you adjust the amount of time between each picture, the type of transition between the pictures, and the order of the pictures. Display Settings let you add titles for the picture count, the picture title, and the feed title, and to set the size of the pictures in the slideshow (centered, zoomed, or stretched). Device Settings let you prevent the screen from timing out during a slideshow and controls whether the slideshow will continue while you're in card view. Application Settings let you use the current wallpaper as the app's background.